The first worktop bin was such a success that I decided to do another one. This time the bin itself is a cardboard drum that used to contain chocolates. It’s rather bigger than my sawn-off milk bottle, and furthermore, the canvas is finer (I’m only using two strands of Paterna in the needle, not three), so the canvas is going to take a little longer to do. 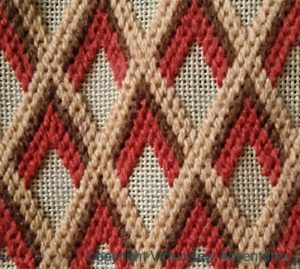 I’m staying with browns, and with diamond patterns, and starting with this diamond lattice pattern. 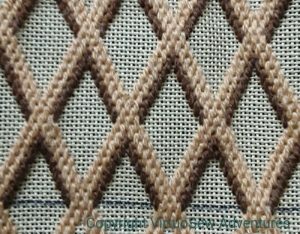 I’ve had enough of the creamy beige wool to work the framework, and since it is only two strands, I should have enough of it to work the edging and seam as well. 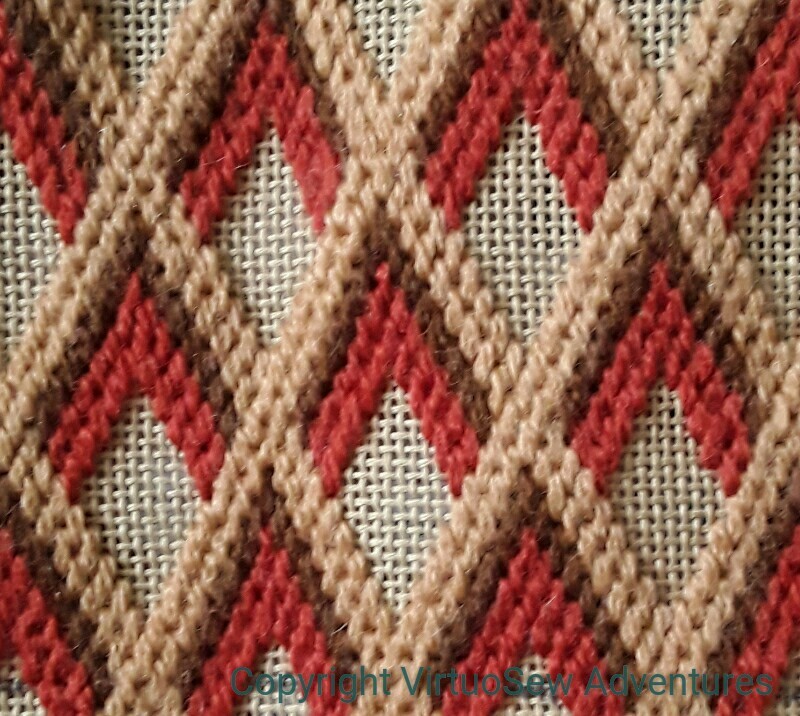 But there is a lot more dark brown to come and I may very well find myself combining threads to stretch my varieties of dark brown to fit the pattern. Never mind, I will then have made some Stashbusting Progress! Right up until the project when you rely on that happening…. Which is why I always ending up buying fresh when starting a new project. Except cross stitch, I just use my stash for that. it’s looking fantastic. yep, I have problems stash busting, it never goes down at all! Looking good! When trying to do a bit of stash-busting, I generally find I don’t have quite the right fabrics, so have to buy more ……. I do like this little (or not so little ) cover. How true, how true about stash busting. I am working on a piece, to use up some old thread, and then find it is so old they don’t make that colour anymore and the pieces I can find are from a different dye batch. My stash does go down but only to the things I don’t want to use! Looking good, Rachel. 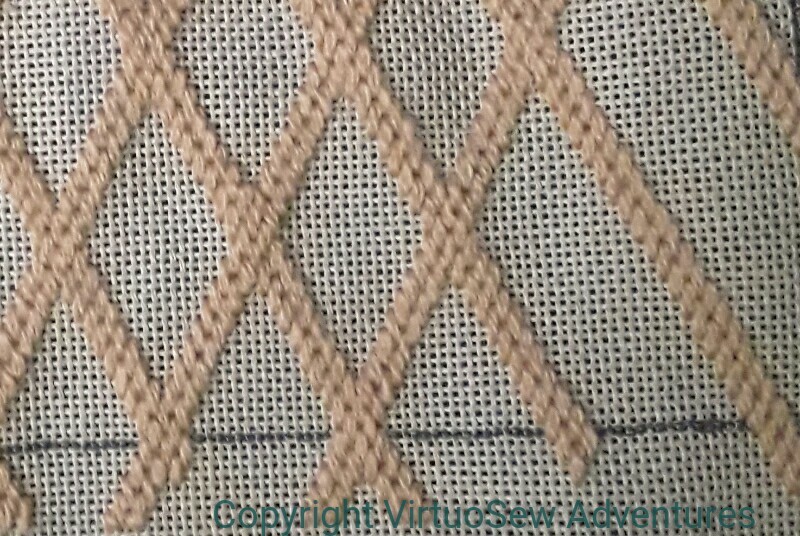 So annoying when the perfect fabric (thread) is just that bit short……and necessitates a trip to the shops!! You will have the smartest desk in town with the two bins. The joy of Stash. I had a small amount of green Stef Francis AA silk in the stash that I wanted to use on the background for the crocus piece I’m currently doing. Just enough left, I decided. Except two-thirds into the backgrounds I figured I did not have quite enough. So last night I put in an order on their website to get another skein, and some other colours of course: you can’t just stop at one…. Of course, by bedtime I’m now sure do I have quite enough green to finish the piece, after all. Oh well, the new skeins will come in useful – eventually! 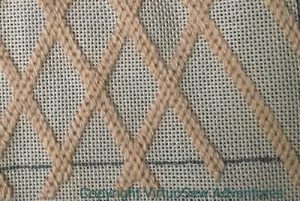 As always I love your stitching. I’ve just been through a BIG stash busing event. The craft section at our local thrift store is full of Penny’s castoffs. BUT I love the end result. I know where everything is and I’m going to try to keep it that way. Ah well, you know ‘best intentions’!! For me stash busting works only as a theory..I end up buying more to finish the stash buster project and end up adding more threads to the stash.I stitched the same pattern in blue/yellow combo and turned it into a needle book. One of the greatest truths of embroidery! Love the canvaswork as well!! This is going to be another pretty project! I always love to see your needlepoint pieces. 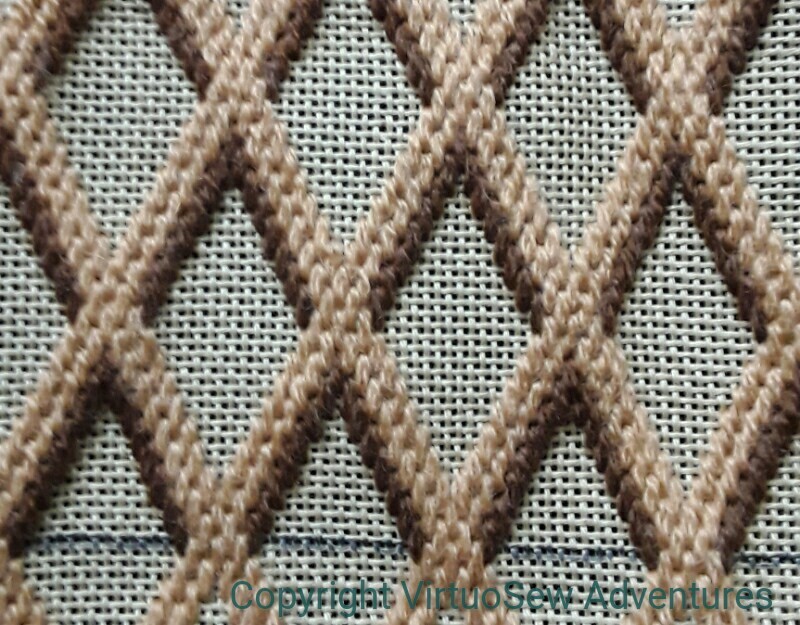 I love the precision of each stitch….